Most likely, you already have at least two electronic calendars scattered in different places: a calendar tied to your work computer and a personal calendar. Now you have a third one — the one on your Samsung Galaxy S8 phone that is synced to your Gmail account. Bringing together all your electronic calendars to one place, though, is one of the best things about your phone — as long as you’re a faithful user of your electronic calendars, that is. To begin this process, you need to provide authorization to the respective places that your calendars are stored in the same way as you authorized access to your email accounts and contacts. This authorization is necessary to respect your privacy. If your phone doesn’t have a Calendar icon on the Home screen, open the Calendar app from your App list. This same app works with the calendar that’s stored on your phone and any digital calendars that you add. When you first open this app, you see a calendar in monthly format, as shown here. When you add an account to your phone, such as your personal or work email account, your Facebook account, or Dropbox, you’re asked whether you want to sync your calendar. The default setting for syncing is typically every hour. Unless you get a warning message that alerts you to a communications problem, your phone now has the latest information on appointments and meeting requests. Your phone continues to sync automatically. It does all this syncing in the background; you may not even notice that changes are going on. 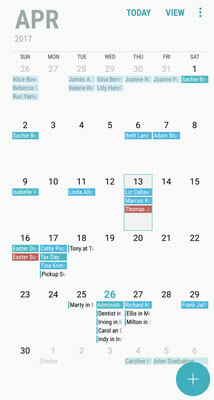 You could encounter scheduling conflicts if others can create events for you on your digital calendar. Be aware of this possibility. It can be annoying (or worse) to think you have free time, offer it, and then find that someone else took it.